East of Dallas an hour or two, as the land begins to roll and turn into what Texans refer to as "The Piney Woods" of East Texas, one can watch day by day the change in the Bald Cypress as the green leaves begin to turn a brilliant orange, starting at the tip and working rapidly toward the branch and trunk of the tree. It's a sign of things seen all around. In the marsh areas of lakes and ponds, lily pads begin to change color. Still floating, they are now backed by the brilliant red reflection of sumac that grows near the shoreline. 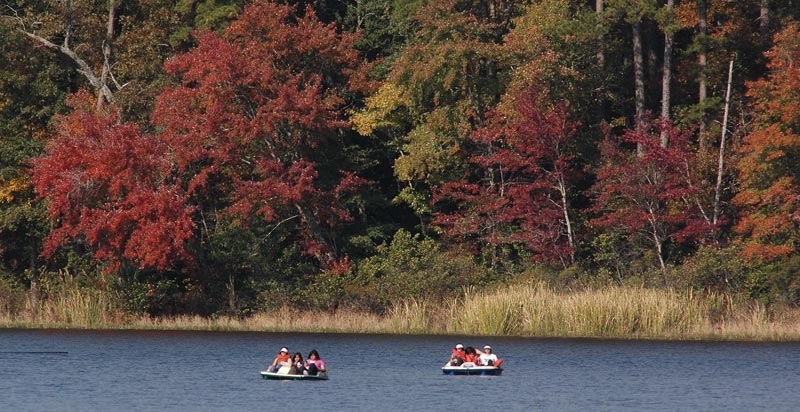 Fall is the time for many to get on a lake on a lazy Sunday afternoon to enjoy the gentle breeze and lovely colors that are all around. Double your pleasure and go in search of reflections. They are almost everywhere. 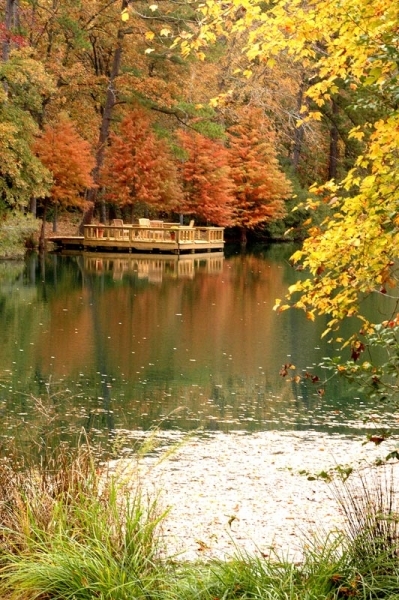 For the most vivid and warm colors, be at your favorite lake or pond in the early morning or late afternoon. Those colors can be stunningly beautiful in the rising or setting sun light. Be alert and you'll find simple pleasures where you least expect to see them. At your feet ants may be foraging for food they will store for the winter or even building materials for their nest. Look closely at the photograph and you'll see one ant has a bit of the road surface it is carrying to the entrance of a nest some 20 feet away. 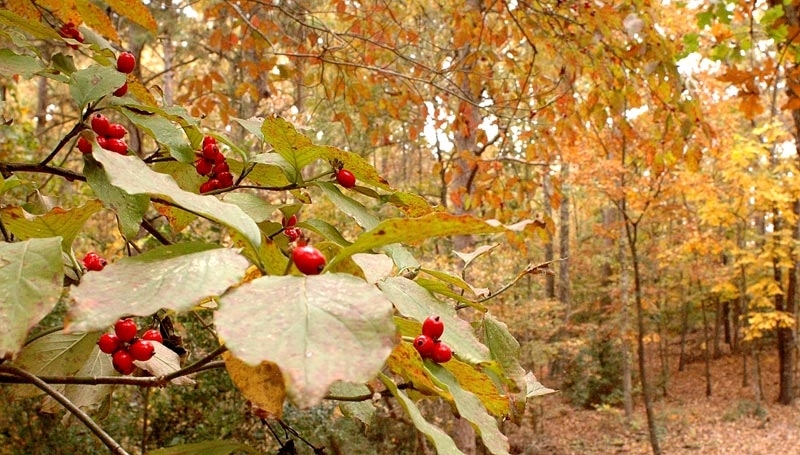 At head level or just above you may find the beautiful dogwood tree, with red berries in the fall. In March, with spring-like weather here to stay, those same trees will be a beautiful green with the white or pink blossoms that are a favorite among those lucky enough to have them in their area. 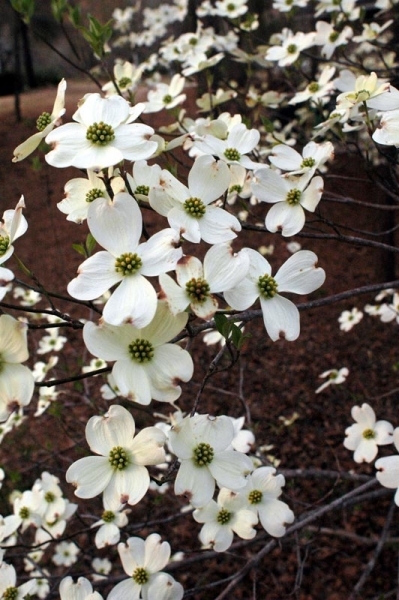 If dogwoods in bloom happen to be one of your pleasures, Wood County is particularly blessed with a large number of those trees. One of the more spectacular areas can be found on Farm-to-Market 2869 north of Hawkins. Take FM 14 north out of Hawkins and five minutes later turn east on FM 2869 and enjoy the next few miles.